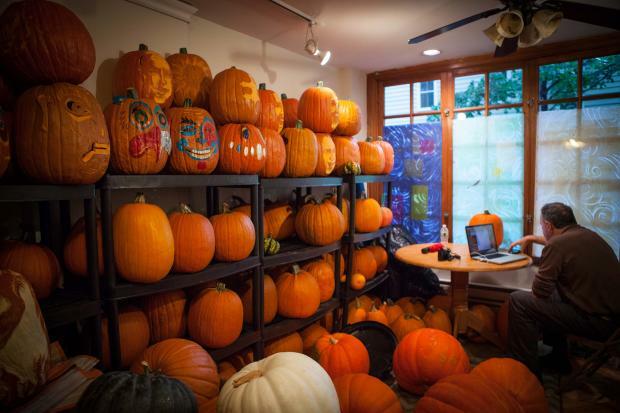 NEW YORK CITY — When it comes to pumpkins, Hugh McMahon is top gourd. A professional carver for the past 35 years, McMahon has sliced everything from celebrity mugs to the official White House pumpkin portrait of President Ronald Reagan, turning the orange vegetables into glowing works of art. McMahon likes to think of his carvings as light sculptures that come to life when set aglow. “You put the light in and you get this dramatic effect," he said, sitting in his studio in Brooklyn Heights, which is bursting with orange pumpkins that line metal shelves stacked to the ceiling, and lay huddled on the floor. 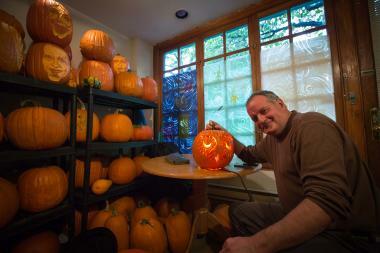 With a background in fine arts, McMahon said his goal has always been "to take pumpkin carving where it hasn't gone before," inventing new techniques such as the increasingly popular "skin cut" where he shaves down a pumpkin's skin instead of cutting all the way through it, revealing varied amounts of light. "The way I carve is I cut into the skin at different depths, so you get this kind of dimensionality and this 3-D kind of effect," he explained. In his years in the business, McMahon has been commissioned to carve the likes of everyone from Secretary of State Hillary Clinton to celebs Heidi Klum, Bette Midler and Mariah Carey for various Halloween parties and events. His designs have also been featured everywhere in Studio 54, in the Whitney Museum and various magazines. This year, he's designed a flock of angry birds, including eagles, hawks, vultures and crows, and his work is currently on display at Chelsea Market. McMahon said political portraits are especially popular this Halloween, with ghoulish versions of President Barack Obama and GOP challenger Mitt Romney frequent requests. Romney, he said, is the toughest to carve. "The political pumpkins are very hot," he said, adding that he expects to see many exciting designs adorning local stoops in the coming weeks. "More people are doing more elaborate carvings," he said. McMahon recently sat down with DNAinfo.com New York to show off his technique and share some of his tips about how wanna-be jack-o-lantern mavens can up their pumpkin game. Pick the perfect pumpkin: In addition to a smooth, unblemished surface and sturdy stem, McMahon advises pumpkin pickers to scope out gourds whose shapes match their planned designs. If you want to carve a spooky, elongated face for instance, choose an oblong pumpkin with lots of vertical space. If you’re more into landscapes, try a fatter, rounder shape. The color of the pumpkin can also make a difference. The lighter the shade, the brighter it will glow, so keep that in mind as you're choosing, he said. Go in from the bottom instead of the top: While most carvers automatically slice their access holes at the top of their pumpkins, creating a removable lid around the stem, McMahon recommends going in through the bottom instead. This will help pumpkins keep their shape longer and prevent the top from caving in. Lobotomy time: After cleaning out the seeds and gunk (or "pumpkin brains," as some affectionately call them), McMahon uses a metal ladle with the stem cut off as a scraper. He recommends shaving the pumpkin's walls down to about two inches-thick so they're uniform and easier to carve. Choose the right design: One of the top mistakes McMahon sees is cliché designs that have been done again and again. Instead, he advises carvers to be creative. "Just use your imagination and make a drawing before-hand. Get the composition right," he said. If you're in need of inspiration, try buying a cheap carving kit, available at any Halloween store, or try sites like these. If you're not the drawing type, many provide stencils you can print out and transfer onto the pumpkin's surface using a pencil or pins. McMahon also advises choosing a design without too many intricate cuts that goes with the flow of the surface and isn't too straight-edged. And carvers should make sure they scale their designs. "Sometimes people just use little areas for their carving and don't consider the whole shape of the pumpkin," he said. Once you've chosen your design, draw it on the surface of your pumpkin using a water-soluble magic marker, which can easily be wiped off when you're done, he said. Use the right tools. McMahon uses a fruit and vegetable knife for slicing, as well as exacto blades and clay sculpting tools to scrape the skin. For a safer option: try a carving knife set, with multiple-sized blades. Don’t just slice. Think about how you can play with light and depth by shaving down certain parts of the pumpkin or popping up areas to let in different amounts of light. "The deeper you go, you get more glow out. That's how you get the dimension," he said. Also don’t be afraid to use toothpicks or other tools to secure delicate sections in place and prevent pumpkins from falling apart as they start to rot. Make it last. Once you’re done, spray your pumpkin with lemon juice to make it last a little longer. Let it glow. Illuminate your masterpiece with a light bulb instead of a candle, advises McMahon. It’s not only safer, but he said gives a pumpkin a more dramatic glow. Don't fret. McMahon said that people shouldn't be discouraged if they're not pumpkin Picassos. "The techniques I use are pretty simple," he said. "It just takes practice." Try incorporating multiple pumpkins into a single design by giving your Mariachi player a sombrero or your Gene Simmons a guitar. Find some inspiration here. Make your pumpkins even spookier by adding pupils. Cut out small circles using discarded pumpkin chunks and secure them in the center of cut-out eyes with twisted paperclips. Give your pumpkin an eerie glow by adding dry ice, or try subbing regular bulbs for strobe lights for extra pop.